Running an arcade full of animals should be an easy task – right? In Coin-Op Kingdom, from developer Canalside Studios, you are able to run your own arcade exactly as you’d like. However, your customers (and staff) are not the normal crowd that you’d find at an arcade. Instead, they are a variety of different animals; turtles, chameleons, and more. 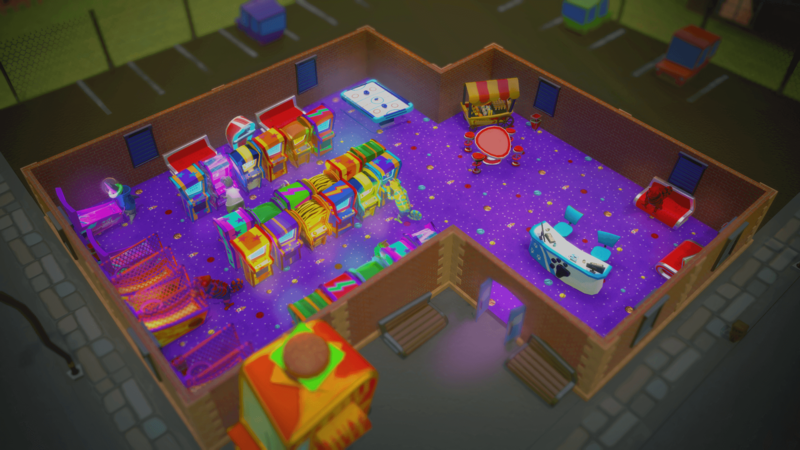 You are able to manage your arcade by spending your funds on different types of arcade machines, food carts, and — of course — on the staff themselves. The various members of staff do different jobs; slugs clean the floor, turtles can be assigned tasks, and moles fix your machines. Your arcade machines, arguably the most important part of your business, come in a wide variety, different shapes, sizes, and genres. The animals that come into your store give visual feedback on their opinion of your arcade — displaying a face above their head showing if they are happy with the machines, service, or prices. You’ll need to keep all of your customers content and busy as to keep your arcade raking in the money. Your patrons prefer to have a variety of genres to play through. From platformers to shooters, your arcade should have a bit of everything. In the alpha demo of Coin-Op Kingdom, which I played at Insomnia 62, I was able to create a small arcade and run it for a few days, completing tasks along the way. Although Coin-Op Kingdom may appear, in its current state, to be a pretty straight-forward management game with an arcade theme, having animals playing your games is quite cool — and there’s plenty of time for the game to develop into a great, and memorable little management title. You can follow development of Coin-Op Kingdom on Twitter, Facebook, or by checking out their website.